Life cycle: Numerous generations per year and often requiring only a couple of days. The adults hibernate in garden debris and under the bark of orchard trees. Physical Description: Reddish-brown to off white. The body is very spider like with eight legs and no antennae, thorax, or wings. They are about 1/150 to 1/50th of an inch long. A 5X lens will help you spot this pes on plants or look for Bugs the size of salt grains. The eggs are laid at the base of plants and on the leaves and buds. 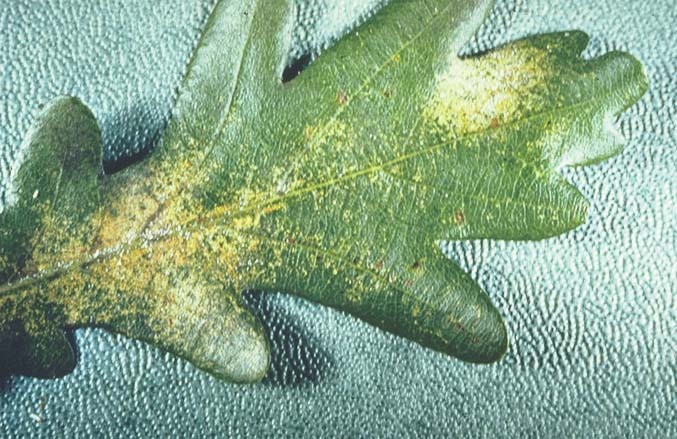 Feeding characteristics: This pest feeds on leaves fruits and roots of most indoor plants, apple, peach, evergreens and strawberries, causing yellowing, first along the veins and then over the entire leaf surface. Fruit trees with severe Mite damage will have small, poorly colored fruit and premature drop. Leaves curl slightly; and a copper color develops on the bottom of the leaf, which is covered with a fine web. 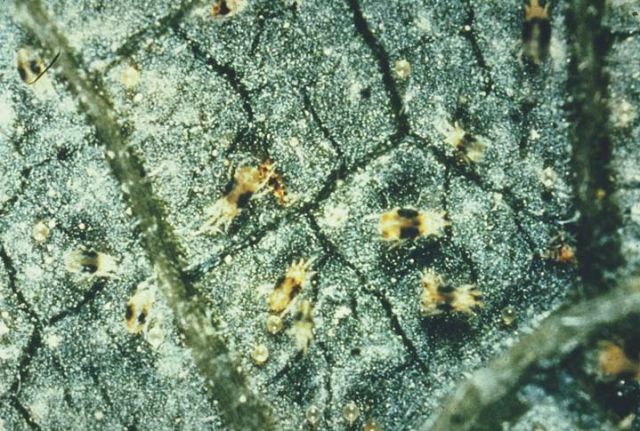 Controls: These pests are not common on unsprayed fruit trees, as many naturally occurring predators feed on all Mite species. They only become a problem when insecticides are repeatedly used, because the insecticides also wipe out the beneficial insects. Lady Beetles or the Spider-Mite Destroyer will eat the Spider Mite. The Predatory Mite is the best Mite predator and can be indoor and out. Insecticidal soap sprays can be used until the Predatory Mite becomes established. In orchards, there have been successful scientific trials that show that intercropping with Alder (Alnus sp.) or mulching with Rye, Wheat, or Sorghum significantly reduces Mite damage.